BE A LOCAL is a part of Hub Japan’s service to match local Japanese people and tourists from overseas. There are various plans posted. 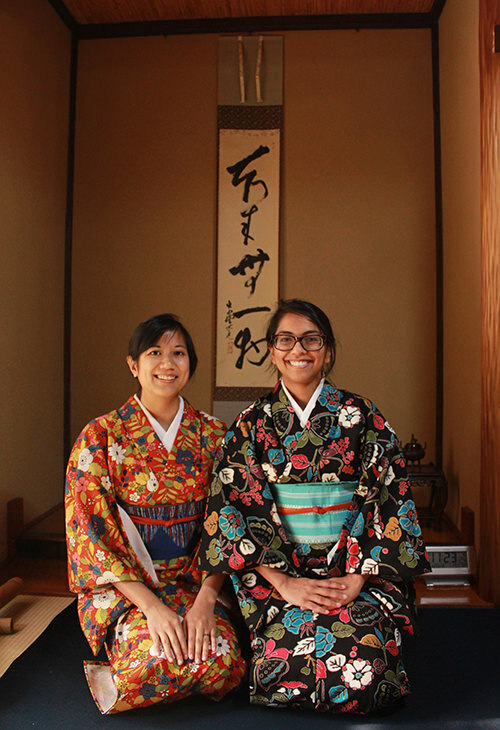 Monica and Malini from Canada requested the plan to experience Japanese tea ceremony at a Japanese mother’s house. It was Monica’s third time and Malini’s second time to visit Japan. They said they had seen major sightseeing spots already on previous visits, so wanted to experience something different for this time. 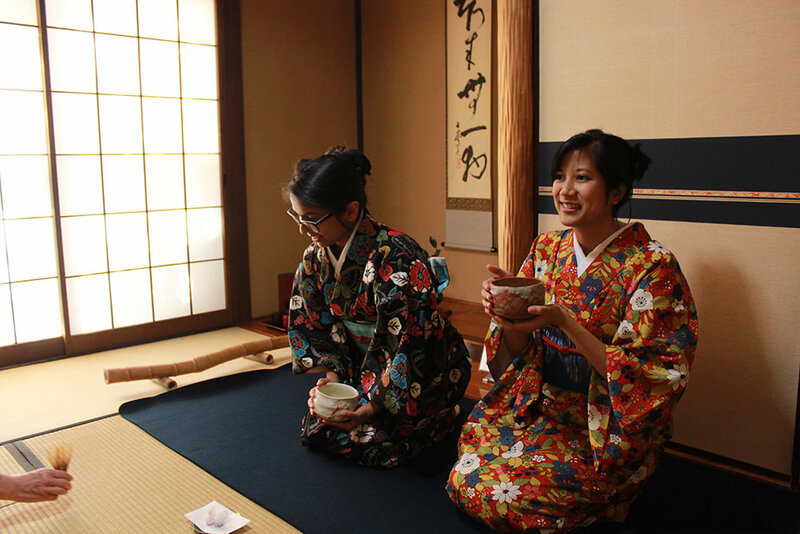 It was such a pleasure that they included Hub Japan’s Japanese tea ceremony experience to their travel journey. We met at the station in Itabashi-ku, northern Japan, where the host’s house is located. We could meet each other smoothly and headed to her house. 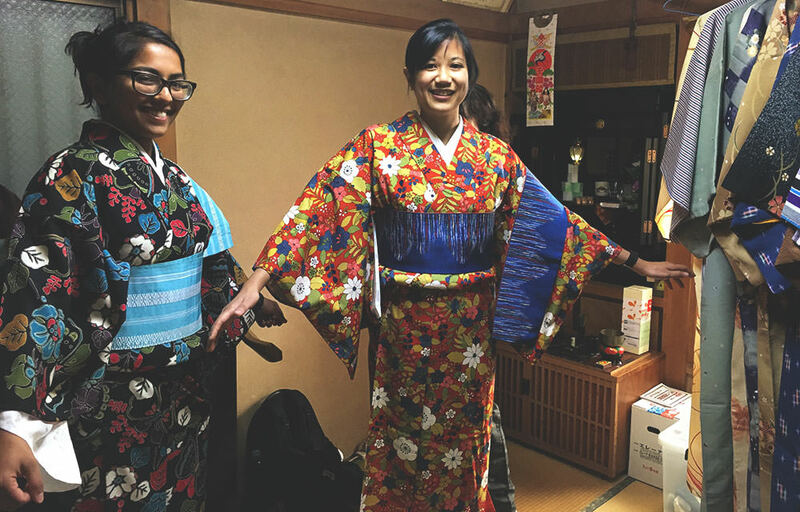 Monica and Malini included a kimono option, so first, they chose a kimono they’d like to wear from about 15 kinds of prints. Then, they chose an Obi, a sash for kimono. The host is well experienced in various Japanese cultural activities and wears kimono daily. She dressed Monica and Malini into kimono so beautifully. They were surprised by the number of layers they had to put on to wear a kimono! Dressing in Kimono at a tatami room. When they finished dressing up, moved to the room where tea ceremony experience is held. Photo in front of Tokonoma, a recessed alcove. The ceremony was begun, and the host started to make a tea. The room is so quiet, only the sound of the host making teas surrounded us. A small snack was served first because it is supposed to be eaten before drinking the tea. They enjoyed a piece of Japanese snack made of Wasanbon (traditional Japanese sugar) while they wait for the tea. When the tea is ready, the host taught them how to bow and receive the cup. If you are a female, you should put your hands in a triangular shape when you make a bow. Turn the cup few times to make the cup into a right direction. Drinking a freshly prepared matcha tea. After the one round ceremony, the host explained about the day’s atmosphere, cups, and equipment. The tea ceremony is not about just drinking the tea. Everything is supposed to be organized by the host. Kakejiku (a Japanese calligraphy work hang in Tokonoma), flowers, cups, equipment, the temperature of the tea, etc. She explained in detail about all of them. 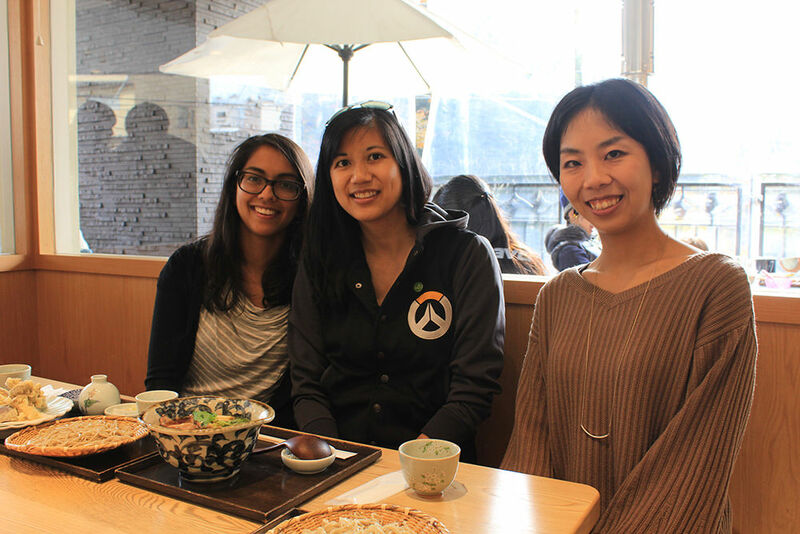 Monica and Malini were surprised to know that so many things were going on in this tea ceremony. Three hours felt very short! We went to a soba place for lunch after the ceremony. It was a beautiful soba restaurant near Rikugien Japanese garden in Komagome. Very fun and interesting! It was really nice to learn about tea ceremony and all the effort and instruments used. Everyone was very nice and accommodating. I really enjoyed wearing a kimono as well, I didn’t realize how much work it was, I appreciated it! EXCELLENT! It was a very warm and inviting experience. I felt honored to have this opportunity! Thank you! Planning and execution were perfect. The hosts were wonderful. I would recommend this to everyone! 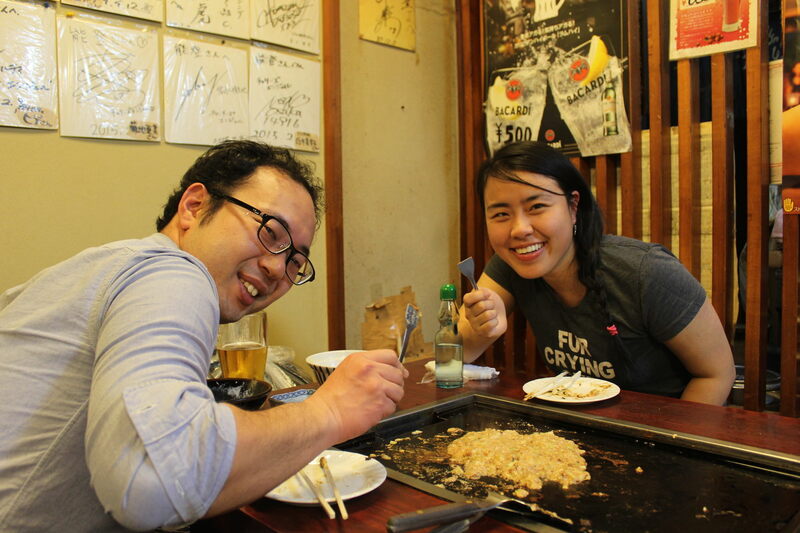 Hub Japan’s BE A LOCAL provides plans to meet locals and experience real Japan. Why don’t you participate in one of the plans with Japanese locals?